While it would have been better if the NHL had eliminated the trapezoid entirely, increasing the area behind the net where the goalie can play the puck will be a change for the better in 2014-15 and hopefully will lead to the trapezoid's elimination in the near future. By not allowing the goaltender to play the puck in the corner, teams have more incentive to dump the puck in, and this has resulted in an increase of prone defenders taking violent hits along the boards from forecheckers with a full head of steam, something that has become more worrisome as the NHL struggles to deal with head injuries. In addition, removing the trapezoid will reward more talented teams/players who are capable of successfully carrying the puck into the zone while further decreasing the success rate of the dump and chase style of play. Goalies with good puck skills will also become more valuable as they'll be able to help clear their zone and get the puck back up ice. The trapezoid was an interesting concept coming out of the lockout in 2005 as an attempt to increase offense, but it's outlived its usefulness and, if this rule change is any indication, is on the way out the door. The ‘Spin-O-Rama’ move, as described in Section 24.2 of the 2013-14 NHL Rule Book, will no longer be permitted either in Penalty Shot situations or in the Shootout. This is less of a rule change than a re-interpretation of the rules already on the books, but the Spin-o-Rama move will now be disallowed as the NHL moves back to strictly enforcing its rule of maintaining forward movement of the puck during penalty shots and shootouts. Even after almost a decade in the league the shootout still feels gimmicky, and the Spin-o-Rama move even more so. While exciting to see at first, the novelty has worn off and it's become a move perfected in practice to be used at no other times than these situations. In addition, it's come to a point where the shooter was waiting until being just on top of the goalie before starting their spin, effectively boxing them out and sliding the puck into an empty net. If the NHL is going to continue to use the shootout to award meaningful points then this was a good step to take, although a situation where the shooter starts on the opposite blueline, a defender on the redline, and play continues until either a shot or a change in possession would be far more interesting, based more on actual hockey gameplay, and reward talent far more than the current system. * Rule 38.4 (viii) has been modified to allow broader discretion to Hockey Operations to assist the referees in determining the legitimacy of all potential goals (e.g., to ensure they are “good hockey goals”). The revised Rule will allow Hockey Operations to correct a broader array of situations where video review clearly establishes that a “goal” or “no goal” call on the ice has been made in error. The new expanded rule will also allow Hockey Operations to provide guidance to referees on goal and potential goal plays where the referee has blown his whistle (or intended to blow his whistle) after having lost sight of the puck. * In reviewing “Kicked in Goals,” Hockey Operations will require more demonstrable video evidence of a “distinct kicking motion” in order to overrule a “goal” call on the ice, or to uphold a “no goal” call on the ice. Given that goals are scored so infrequently in the NHL, and seemingly declining every year, the ability for Hockey Operations to assist the on ice referee in getting goal calls right in any way is a positive development. But the big rule change here is increasing the threshold between what is a good goal off a player's skate and one that is taken away due to being kicked in. With the way things are now it's far too difficult to tell sometimes whether a goal will be allowed or disallowed, and too many times too much of a judgement call is left to the referee on such an important play. By requiring more demonstrable evidence that the offensive player was trying to deliberately kick the puck into the net, the borderline goals from previous years will (hopefully) all be allowed to stand while the truly egregious kicks will be taken off the board. The rule relating to “Tripping” will be revised to specifically provide that a two minute minor penalty will be assessed when a defending player “dives” and trips an attacking player with his body/arm/shoulder, regardless of whether the defending player is able to make initial contact with the puck. This rule might end up penalizing solid defensive play from a player able to get up ice and knock the puck away, but there are likely safety concerns at play and it'll help increase scoring chances by 1) providing power plays on odd man rushes that might have otherwise been broken up and 2) allowing more odd man rushes to play out if trailing defenders decide the desperation play isn't worth it. The supplementary discipline penalties associated with Rule 64.3 (Diving/Embellishment) will be revised to bring attention to and more seriously penalize players (and teams) who repeatedly dive and embellish in an attempt to draw penalties. Fines will be assessed to players and head coaches on a graduated scale outlined below. It's nice to see the NHL try to attack diving more through supplementary discipline, but it seems like the NHL could have more aggressively set a deterrent than what they've provided. The coach fines aspect of the penalty is a good start, but there should have been automatic suspensions added somewhere in the penalty for serial repeat offenders, and the fines and very gradual increases of the fines could have made it hurt much more for players who decide they want to try to buy calls. It's a step in the right direction, but hopefully it is followed up with stiffer penalties in upcoming years. The league changed the icing rules coming out of the lockout to require the offending team to stay on the ice after icing the puck, but as time passed teams were able to find ways around the rule to give their tired players more time to catch their breath. 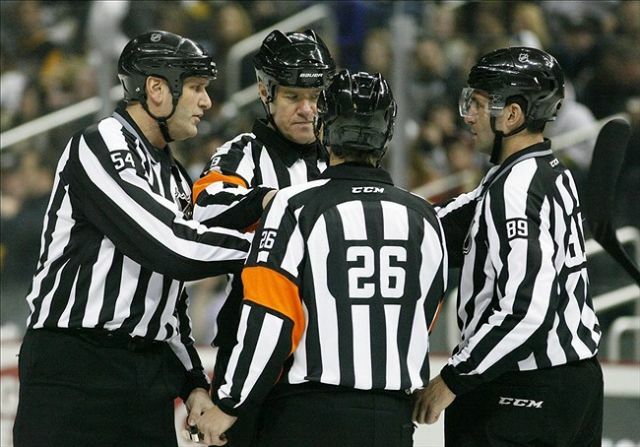 Teams have been purposefully committing face-off violations in order to be kicked out of the circle and waste time so their players could recover. This rule changes that and should lead to increased offense, whether from fresh players being able to take better advantage of the tired players left on the ice or from penalties if the face-off infractions still continue to occur. overtime in the regular season. three shooters in the shoot-out has been eliminated. Of the rule changes announced today, this rule is the least likely to affect the on-ice play, although eliminating the set order of shooters prior to the shootout presents some interesting strategy for head coaches to deal with. Coaches will be able to react to the shootout as it's happening and send out their shooters accordingly instead of setting a lineup and hoping they've played their cards right beforehand. There have been further rule changes made relating to face-off location to avoid penalizing teams for plays intended to create bona fide scoring opportunities. Specifically, the following are “categories of plays” where face-offs will remain in the attacking zone despite the fact that the attacking team was technically responsible for the stoppage in play: Shots at the net by a player on the attacking team where: (i) the shot breaks the glass; (ii) the shot goes off the side of the net and deflects out of play; (iii) the shot goes off the dasher boards or glass and deflects out of play; (iv) the shot is tipped or deflected out of play by a teammate; and (v) the shot becomes wedged in or on the exterior of the goal net. This is another rule that will help offensive play as teams that are shooting the puck don't have to worry about being kicked out of the zone if the puck takes a bad bounce. This will lead to more offensive zone face-offs, and with that likely more scoring as well. It's doubtful any drastic increase will be seen, but every little bit helps.